It’s 3 a.m. on Saturday, July 23 and deep in the woods of Legend Valley in Thornville, Ohio. While the quiet village only claims about 990 total residents on any other night, right now it’s housing thousands of spectators from all over the world, many of them in painted faces, celebrating ten years of one of the most violent spectacles on the planet: Bloodymania X, live from rap duo Insane Clown Posse’s Gathering of the Juggalos. The Gathering—the annual multi-day festival celebrating the clown makeup-wearing, violence-loving, and aggressively familial “Juggalo” culture—is in it’s 17th year. Pro wrestling is part of Juggalo culture the same way graffiti art is part of hip-hop culture, and with some of the most famous wrestling talent in the world in attendance, it’s easily the biggest night in Juggalo Championship Wrestling history. But what proceeded as a lively event featuring home-grown talent in intergender matches, former WWE stars playing heel cops (“Juggalos lives don’t matter!”), and genuinely emotional retirement speeches ended with what one attendee called “a trainwreck of a moment.” It happened after JCW champion Kongo Kong defended his title against Lucha Underground wrestler “The Chocolate Juggalo Sensation” Willie Mack and the show’s headliner Former WWE World Heavyweight Champion Jeff Hardy. Much was written online about the aftermath where, after Kong retained the title, a lone Hardy stayed in the ring to erratically destroy tables and ladders by himself before allegedly taking a cardboard cutout of Arnold Schwarzenegger up a ladder and pointing to the sky in tribute, as if the former California governor had died. As Jeff Hardy tells Complex, that’s not the way it happened. “I finished the match with a [frustrated] breakdown where I’m trying to break a ladder, break tables…” Hardy says. “Many people hadn’t seen that, so naturally people are wondering ‘what the Hell is wrong with Jeff Hardy? Oh my God, he’s off the wagon!’ And this-and-that. It was nothing like that.” One Juggalo’s post wound up being taken as a primary news source for many pro wrestling news sites. According to Hardy, the breakdown was simply a preview for what’s next for his character on TNA. As for the cardboard cutout of Arnold? A case of mistaken identity. Juggalo Championship Wrestling itself, started by Insane Clown Posse duo of Violent J and Shaggy 2 Dope, began as a passion project and wound up becoming a legit professional wrestling promotion. The rise of JCW coincided with the growth of the Gathering of the Juggalos, and in 2007 Bloodymania was born. In the decade since, JCW has seen some of the all-time biggest names in wrestling including “Rowdy” Roddy Piper, Jerry “The King” Lawler, Kevin Nash, Scott Hall, X-Pac, “The American Dream” Dusty Rhodes, and Terry Funk, who even wrote at length in his autobiography how much he enjoyed The Gathering experience. It’s also been host to some of WWE’s current biggest stars including Kevin Owens and Cesaro. Don’t be the least bit negative to any of [the Juggalos], otherwise they’ll all turn on you. 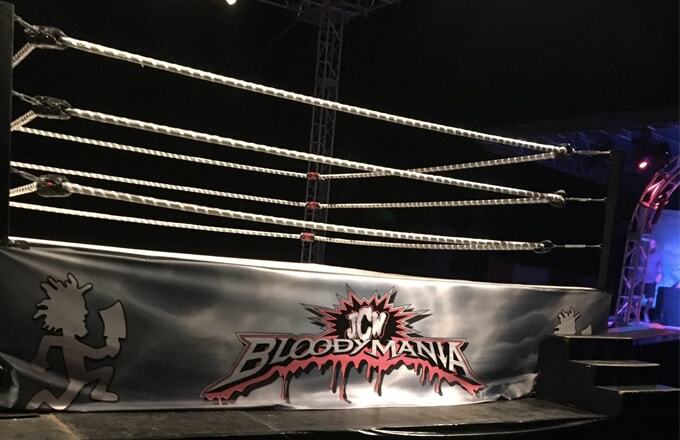 The Clowns try and make each Gathering bigger than the last, and with it being the 10th annual Bloodymania, fans were floored by this year’s special guests. Jeff Hardy, who currently wrestles for competitor TNA Wrestling, would make his Gathering debut. Also on the bill would be longtime friend of Juggalo wrestling and perhaps the most famous non-contracted independent wrestler on the planet, Colt Cabana, as well as recently released WWE mainstay Swoggle (formerly Hornswoggle).